Planning a camping trip? If you’ve ever camped in the wrong size or style of tent, you likely know how agonizing that experience can be. Camping should be fun – you should be out their enjoying all the sights, sounds, smells, and experiences that the great outdoors has to offer. Unfortunately, a tent that is old or ill-suited to the particular conditions and company with which you are camping can make your trip incredibly stressful. Tents marketed as 4 person tents are not always so. You must read up on the reviews and do your due diligence before laying out your hard earned cash. When you’re looking for the right four-person tent, you need to considers its dimensions, seasonality, affordability, durability, and any extra features that may be important to you. 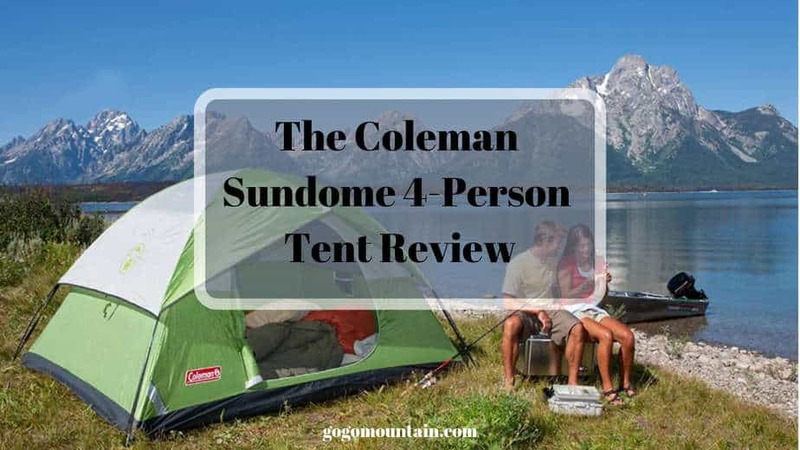 Picking out the proper tent for your needs and preferences isn’t easy, but we hope to make it a bit simpler for you with our review of all things good, bad, and in-between with the Coleman Sundome 4-Person Tent. This dome tent may not be ideal for people looking for extra headroom, but it certainly doesn’t take up a ton of space, either. It offers plenty of room for a queen-size mattress, sleeping at least two people comfortably in this fashion. It’s marketed as being for four people, but likely you would want to camp in this with less than four for maximum comfort. Clocking in at nine by seven feet, the tent has a small imprint and doesn’t allow you to stand up in the middle (unless you are less than five feet tall, that is). The tent allows in a lot of light, as it is made out of mostly white walls and spacious windows. 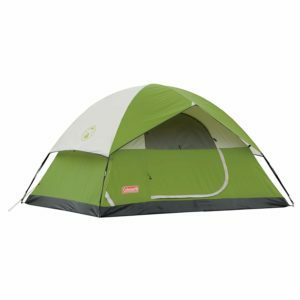 Another popular feature of this tent is the fact that it comes in multiple colors, including green, black, and grey. While this feature doesn’t matter to everybody, it’s a nice option to consider if you’re trying to purchase a tent that is attractive as well as functional. Customers love how easy it is to set up this tent. Most people can do it easily in about fifteen minutes, or even less if there are multiple people around or those that are experienced in setting up this specific brand. All you need to do is feed the poles into the sleeves and then attach the rain fly. Because the pole sleeves are continuous and snag-free, you only need to feed them once, shrinking your setup time in half. The tent is extremely weatherproof. Coleman offers a number of specially patented features that can only be found in Coleman-brand tents. For example, the exclusive WeatherTec system consists of welded floors consisting of polyester fabric. They also have inverted seems, which hide needle holes in the tent and increase durability against foul weather. A cuff protects zippers, preventing zipper leaks, and the tent comes with a built-in heavy-duty tarp floor. This floor raises the tent off the ground about four inches, and makes it incredibly resilient against rainy weather. The tent comes with large screen ceiling panels, which allow for awesome views of the night sky when the rain fly is removed. There is an additional window and door screen to allow for viewing and ventilation as well, as well as a floor vent for added airflow. Complaints about this tent are minimal, with most customers so pleased with the fast setup and waterproof technology of the tent’s design that the disadvantages seem minor in comparison. 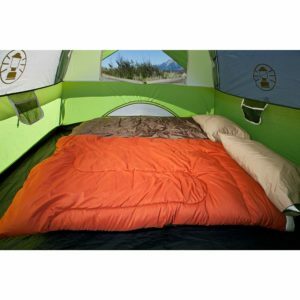 That being said, the biggest complaints have to do with the tents size (which makes it difficult to sleep four fully-grown adults comfortably) as well as the quality of its seams. Some customers have reported zippers and seams that snap or become worn down not long after use. To remedy this, some customers recommend purchasing waterproofing spray or seam protectors to help make it stand up against challenging weather conditions. You also need to make sure you are setting up the tent on clear, flat terrain. This of course is true for all tents, but particularly with this one, since it has such a thick waterproof base. If you fail to set the tent up on perfectly flat ground (which admittedly can be a challenge to find), you might find that the tent leaks or tears ever so slightly. This tent comes with a few additions that make camping just a little bit more comfortable. For example, there is a hook at the center of the ceiling, which allows you to hang wet clothing, cords, or even a lantern to provide some extra lighting. The tent also has mesh pockets sewn to the sides of the walls, providing you with a clean, dry place to store essentials like your car keys, cell phone, or flashlight. The tent is also home to a unique E-Port. This E-Port allows you to run an extension cord through the tent to bring electrical power into your tent, without creating gaps for water or cold air to come inside. Finally, it also comes with a handy carry bag. This bag is perfectly sized for the tent, allowing you to pack ground stakes, door mat, rainfly, poles, tent, and even the instructions all inside one convenient, easy to move compartment. 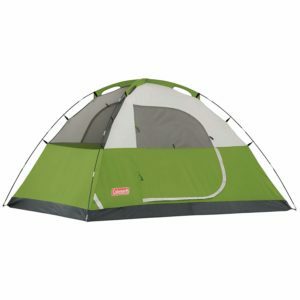 This tent is sturdy, with Coleman claiming that it can hold up to winds of up to 35 miles per hour. While customers attest to this strength, some complain that the stakes could be stronger, as they tend to flex in heavy winds or in harder soils. That being said, what the tent lacks in sturdy poles, it makes up for in ventilation and waterproofing. The windows are large and breezy, and there’s an additional ground vent to keep you nice and comfortable. 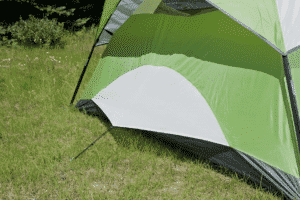 Any complaints about the tent have to do with its durability under windy weather conditions. It does not hold up to heavy winds, as the poles will slip easily from the ground. This is especially true if you are camping on rocky or unstable ground. Consider adding supplementary supports if you intend to use this tent in inclement conditions. Luckily, this product holds up well against most customer complaints, with the benefits far outweighing the negatives. These pros and cons should elucidate how the Coleman Sundome stacks up to the competition. Coleman is one of the most well-known brands in all things camping, and this tent offers no exception. Made in the United States, the Coleman Sundome is a classic option for a small group of people looking for a durable, affordable, and low-maintenance tent. With a spacious interior and quick set-up process, this tent should be on your list of those to consider when you are making your final four-person tent purchasing decision. Don’t just take our word for it, there are over 2500 reviews on amazon.com. Not quite made your mind up yet? Why not read our Top 5 Best 4 Person Tents Review: Read it Here. Why not follow us on pinterest and instagram, links below.